OK, technically pollen isn’t sperm–it’s the tissue that makes sperm. But there’s sure a lot of it caught in this bee’s hair. There’s so much packed on her back legs that it makes them look like puffy pantaloons. 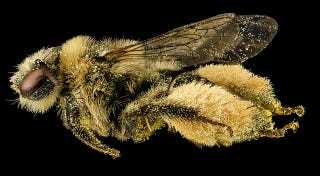 Those “pantaloons” are so full thanks to a big brush of stiff hairs that holds the pollen in place as the bee flies from flower to flower. Mind you, she’s not collecting pollen to do the plants any favors. For her, it’s a protein rich food–she’ll eat some herself, and use the rest to feed her brood. But with so much packed away, there’s plenty left over to fall off as she goes from flower to flower and fertilize each plant she visits.